That's two coats of Sally Hansen Xtreme Wear Purple Potion topped with the orange glitter in clear base pumpkin and then the silver and black in clear pumpkin. I so wish they gave these names, but I guess if they printed all those different labels, they might have to charge more than $2.49. 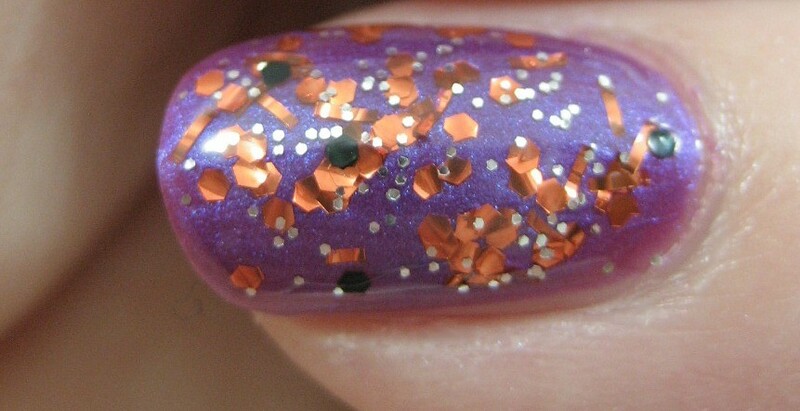 The above shot shows one of the hazards of working with these chunky glitters—the dreaded overhanging chad. I also got some goodies from the swap boxes, but those will have to wait for another day, as right now I need to head home to pass out candy to the trick or treaters. Well, I don't have to, I want to, because I love seeing all the costumes. Ohhh that is different and I like it!!! Very cute! Awww your meetup sounds like great fun! Ohh how fun! Your meetup sounds like so much fun, too! Lovely! I really like your mani, their nails all look wonderful too! Amazing nails! They'r super cool =] And aww the meetup sounds like a lot of fun! Ooo, this looks great! The pumpkin bottles are soo cute too! I love purple and orange together! What a cute NotD! I love it. Great Idea a polish meetup, isnt fun to find people that have the same nail polish affinity that we do, and not looking at you like your crazy! Cant wait to see what you got! 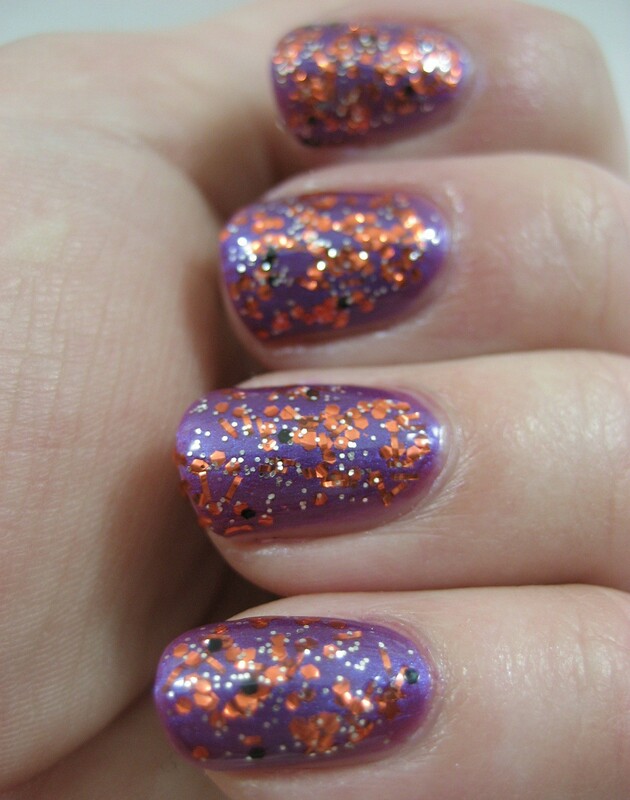 Your mani was perfect for Halloween! And it sounds like the meet up was a lot of fun! Beautiful combination, I love how you made purple and orange work so well! I have always thought of purple as kind of a Halloween color. As far as the glitter overhang I swipe my finger around the tip to push the glitter back on my nail so it doesn't hang over, hate that. 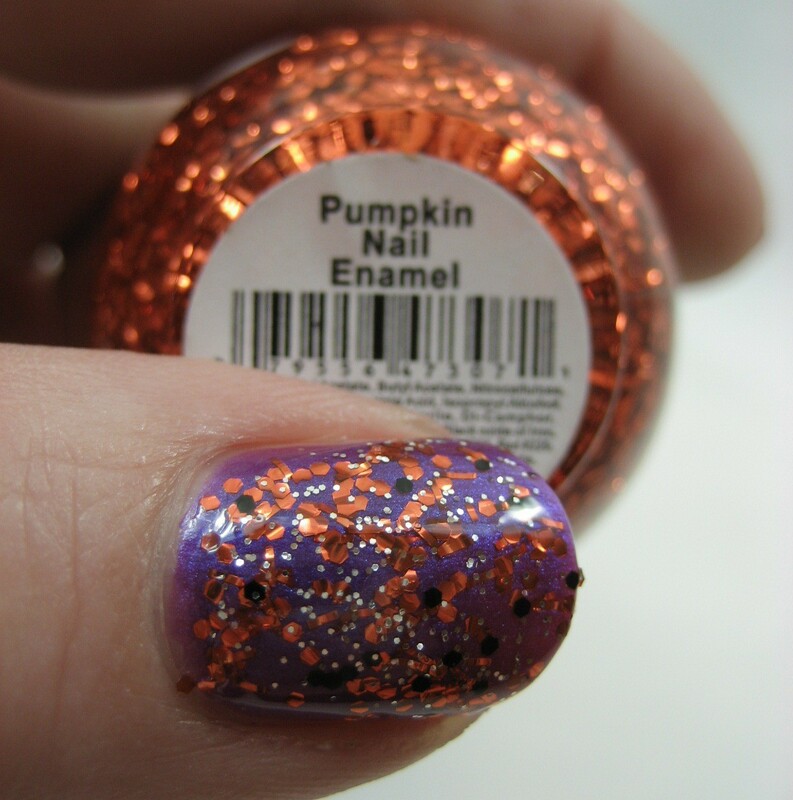 I love the pumpkins glitters and how you layered them! Your meet up looks like so much fun! How fun! Meetups seem like a lot of fun. Love the glitter combo! Super nice nails. I also like the sally Hansen instant dry topcoat. Since when did purple and orange go together? YIKES! Am not a fan of this at all! But love the fact that you look at nail stuff while you commute-eyes on the road my dear!! I think it is a lovely combo! Thanks, ladies! The meetup was indeed fun; I'm hoping we can do another one soon, but it's so hard to coordinate schedules even when it's not holiday time. Fingers, now you're just being silly. :) I only do nail stuff at stoplights (and when I work from home, get two hours that I'd otherwise be in my car to do with what I will, and I generally will to play with polishes.) As far as purple and orange, all that Halloween merchandise can't be wrong!